A light, healthful and flavorful way to prepare a scrumptious Asian meal in minutes! 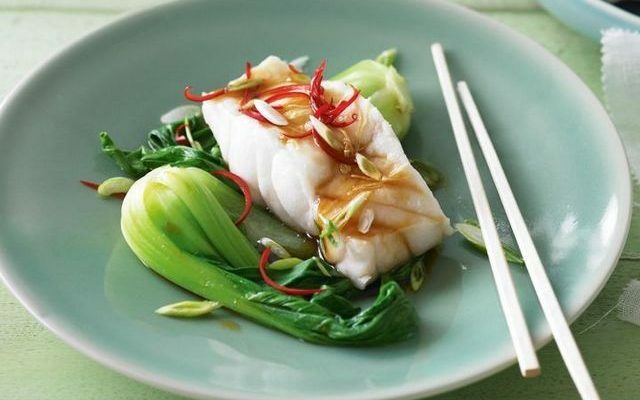 Serve with coconut rice* and bok choy or other Asian greens of your choice. Combine sherry, sugar, oil and Tamari in a small bowl or shaker jar. Whisk or shake to blend and set aside. Prepare your steamer or wok. Be sure that the dish you will use for the fish fits inside and allows the lid to cover snugly. If using a steamer, prepare by adding water as you would for steaming veggies. Place the rack over the water. If using a wok, fill the wok about 1/3 filled with water and place rack over water. Make sure rack doesn’t touch the water. Place the fish in a shallow bowl. Top with shallot and ginger. Add red chili if using. Pour sherry-Tamari mixture over the fish. Cook for 5 minutes or until the fish flakes easily when tested with a fork. Divide Asian greens and fish among 4 serving plates. Drizzle over the juices from the bowl and serve with additional Tamari if desired. *To make easy COCONUT RICE, rinse 1 ½ cups white Basmati rice with cool water (3 times), drain and place in your rice cooker. Add 1 can (13.5 oz.) coconut milk, 1 cinnamon stick and 1 green cardamom pod. You may need to add a little water so that the liquid level is about ¾ inch above the rice. Cook rice for 20 minutes and do not remove the lid or until your rice cooker indicates that rice is done. If using a pot, bring liquid to a boil prior to adding the rice, stir, cover and reduce heat to medium low. Cook for 20 minutes.